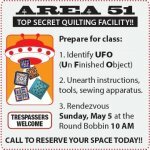 Bring your Unfinished Objects - Pattern, tools - and get them done! The Running With Scissors girls will be there to assist as needed! If that’s not fun enough, they will also be hosting a class party for Lemoyne University graduates! Don’t miss out on the fun.